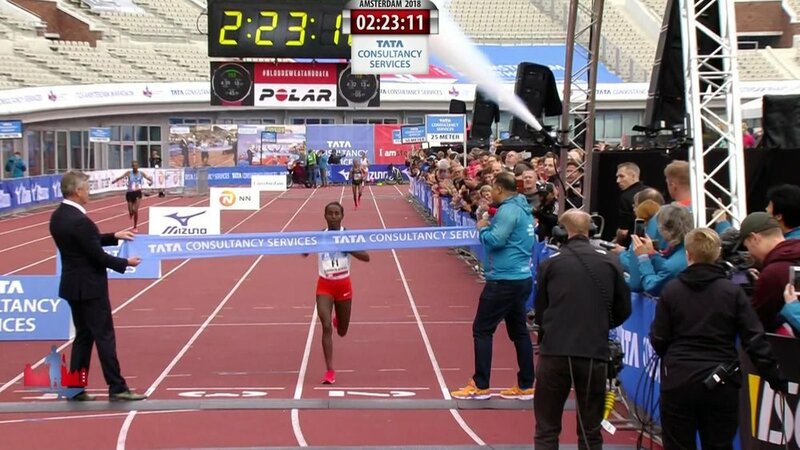 This week, we have a review of the Amsterdam 2018 marathon from David Grima and Barry Louth. They’ve both completed marathons and Ironman events and they have some top training tips and kit advice for you. David Grima: I’ve always enjoyed sport (apart from cricket!) but took up running relatively late, in 2008. My wife (Claire) had taken up running a few years earlier and found she had a bit of a talent for it. She joined a local club (Hercules Wimbledon) and started competing for them. She also used to get up and go to Wimbledon Common parkrun on a Saturday morning and when I eventually joined her, I found I quite enjoyed it. David Grima and his wife compete in many running events together, often finishing in very similar times. Both at the top end of the fields! After doing a few parkruns, I tried a low key cross country race in Richmond Park with Hercules Wimbledon. That led to a half marathon in the October (I just nipped under 90 mins) and it went from there. In Jan 2009 Hercules had one spare club place for the London Marathon which they offered to me (probably just to keep Claire sweet as she was their star runner!). Having always wanted to run it, I leapt at the chance. And then I was a runner. When I was about 10 their races were broadcast at prime time on BBC 1. As a result I took up cross country and I ran with Dartford Harriers. 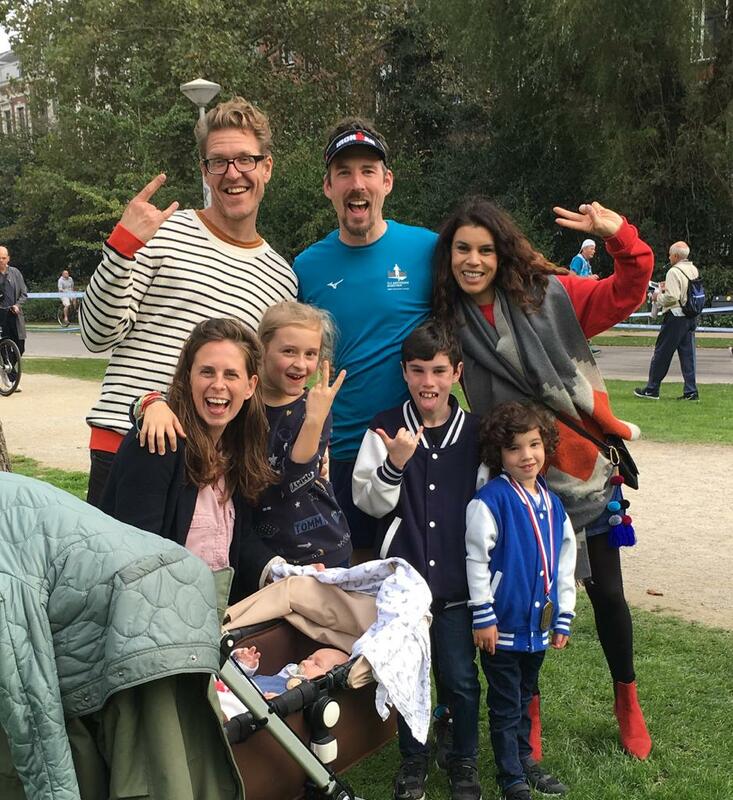 JRF: What made you want to take part in the Amsterdam marathon? DG: We ran it once before, back in 2013 and enjoyed it. It’s a flat, big city marathon, really well organised and super low-key compared to London. It was also the first weekend of half-term so it worked out well timing-wise as Claire is a teacher. So it meant we could have a couple of days after to wander around Amsterdam. Usually we both run the London Marathon. Amsterdam in 2013 is the only Autumn marathon we’ve run before, but having trained hard for London this year and going into it optimistic of PBs, the unseasonably hot weather on the day meant we were a good 10 mins off goal time. As such, we both wanted to try an Autumn marathon to help get over the disappointment of London. BL: My enthusiasm for running slipped away in my teens and I took up running enthusiastically again when I signed up to take part in an Ironman event for charity. I couldn’t really swim well and had never run further than 10km so it was a baptism of fire. I really enjoyed the running and was inspired to go for a sub-4 hour marathon as a result. Since then I have continually tried to improve the time and took part in Amsterdam to go for a PB. I also ran the event last year and really enjoyed it. I have hit upon a model where I sign up for runs in foreign cities, turning it into a bit of a family break. We also have good friends in Amsterdam so it was an excuse to visit them. JRF: What was your training like? Did you try anything different? What were your key workouts? DG: Training went well. No missed sessions, illness or injury..
We didn’t really start ‘proper’ marathon training until after our summer holiday, so was only really 10 weeks plus a 2 week taper – significantly less than London. So that was the main difference. Plus training through the summer rather than winter. We were both in fairly good shape, so it was just a case of adding those key sessions. Long runs, marathon pace sessions and tempo runs. Another difference was I didn’t do a long run over 20 miles, whereas usually I will do 22, 23 & 25 milers. BL: I do most of my training to and from work. Effectively turning a three train commute into my training schedule. I much prefer to run as a means of getting from A to B. It also helps fit training commitments around work and family life. In terms of training I was given some advice to try intervals and having signed up for another event next spring I am planning on joining a running club to start some track work. This in particular is advised will and will really help improve overall speed. JRF: Can you tell us a bit about your race performance. What were the highlights? And where did you struggle? DG: The race went perfectly to plan. Half way in 1.21.54 and then the second half was only 10 seconds slower. The even pacing was the highlight. And beating Claire for only the 2nd time in 11 marathons (only joking!!). With 10k to go it got tough but I never doubted my target time was in doubt. I was doing a lot of maths in my head trying to work out my predicted finish time, but nevertheless the last mile seemed to go on for an eternity! BL: I had an unrealistic target time of 3.10 in mind. I don’t really use any tech when running, preferring to rely on feel. I think I am going to treat myself to a Garmin watch as I learnt the value of maintaining a consistent pace. Having started too quickly I really struggled at around the 17 mile mark but recovered relatively quickly to manage a PB. I also better appreciate that although even a 2 minute improvement over 26 miles doesn’t sound like much, it really does require a great deal of effort and training. I also guess performance can really just come down to how it all goes on the day. JRF: What tips do you have for other runners for the marathon? Bank lots of easy miles (commuting is good for this) and then once you have a good base, start adding 5-7 mile tempo runs and a longer marathon pace session every other week or so. If you’re new to it, don’t do too much too soon. BL: I am definitely not an expert but having run a few now I would make sure that you follow a training plan, put the training in, try to stick to a consistent pace and enjoy the run. Regular massage, if you can afford it, is definitely a recommendation to aid recovery and prevent injuries. JRF: What are your top kit and nutrition recommendations? DG: I’m not too much of a kit geek on the whole, but I have seen that you can now buy Garmins which are compatible with Spotify. So you can play your Spotify playlists through your Garmin. As a big music fan that seems a must have bit of kit! The Garmin Fenix 5 Plus running watch allows you to play Spotify, making running much more enjoyable. I have recently started wearing On trainers (like a lot of others seemingly). They are really comfy if a little pricey. I use 2XU compression shorts for marathons as gels fit nicely and safely down the sides. My OMM Last Drop back pack is an essential bit of kit for commutes. I started using SIS double espresso gels. Sounds horrible but actually really tasty! JRF: What’s your next challenge? DG: Keeping fit and enjoying the cross country season. Last year Hercules Wimbledon were just pipped at the last race of the season, losing out on winning the highly competitive Surrey League XC to arch rivals Kent AC. Cross country is not my forte – a top 100 position is a good result for me, but it’s great fun and builds great strength which feeds into all other running. The team spirit and camaraderie in often grim conditions is brilliant. As yet I’m still thinking I’ll skip London next year and enjoy watching it with my boys for the first time. They’ve been to the London Marathon every year of their lives, but only ever with my parents as Claire and I are always running. I can use your feedback to write articles that help you achieve your goals. Newer PostWendover Woods 50 Mile Race Review - 2nd Place and a 140 Mile Week!